THE Non-Governmental Coordinating council (NGOCC) is saddened that the Patriotic Front is determined to stop Tasila Lungu’s expression of interest and intention to contest the position of deputy mayor for the city of Lusaka. NGOCC Executive Director Engwase Mwale said the organisation felt that it was an outright infringement on her democratic right both as a woman and a citizen of Zambia. “If this is true, it is an affront to the country’s commitment to affirmative action which we, as a country, should be championing. Tasila is a young councillor whose election to the local government should cheer all well-meaning citizens,” she said. Ms Mwale said Tasila’s aspiration was very much in line with the gender balance principle that Zambia was party to in the SADC protocol on gender and further noted that the PF manifesto was clear on the party championing gender equity and equality. NGOCC has since appealed to all political parties to endeavour to create an even and enabling environment for all regardless of gender to participate in positions of influence without fear , intimidation and victimisation especially that the PF are the party in Government. Young Women’s Christians Association (YMCA) and some UNZA students known as ‘PF Pink’ endorsed Tasila’s candidature, saying they needed a young and vibrate leadership who was more qualified to understand national issues affecting the youths. YMCA executive director Patricia Mphanza said the decision by Ms Lungu to contest for deputy mayor was a plus to the women movement particularly young women ascending to leadership position. And the Zambia National Women’s Lobby (ZNWL) executive director Beauty Katebe said the organisation was 100 percent behind Tasila‘s vying to contest on Lusaka deputy mayor seat. Ms Katebe said it was Tasila’s democratic right to stand, hence her democratic rights should not be infringement upon. But PF Secretary General Davies Mwila has already instructed councillors in Lusaka to support the candidature of Christopher Shakafuswa of Mpulungu ward 23 who has also expressed interest in the post. Tasila, who was elected as Nkoloma ward councillor in the Chawama constituency in the just ended 2016 election, said she is now ready to serve the greater city of Lusaka as deputy mayor. And Gallant Youth in Zambia (GYZ) says there is nothing wrong with Tasila aspiring to the position of deputy mayor of Lusaka because more women and the youth are needed in key decision-making positions. 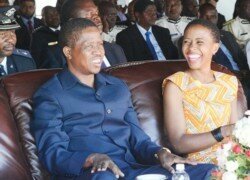 GYZ executive director Henry Mulenga said that Tasila had all the qualities needed of a selfless leader and that the fact that she was from the First family did not mean that she was limited in her aspirations to lead the country. Mr Mulenga said, the hullabaloo that has characterised the deputy mayoral position should be stopped immediately.